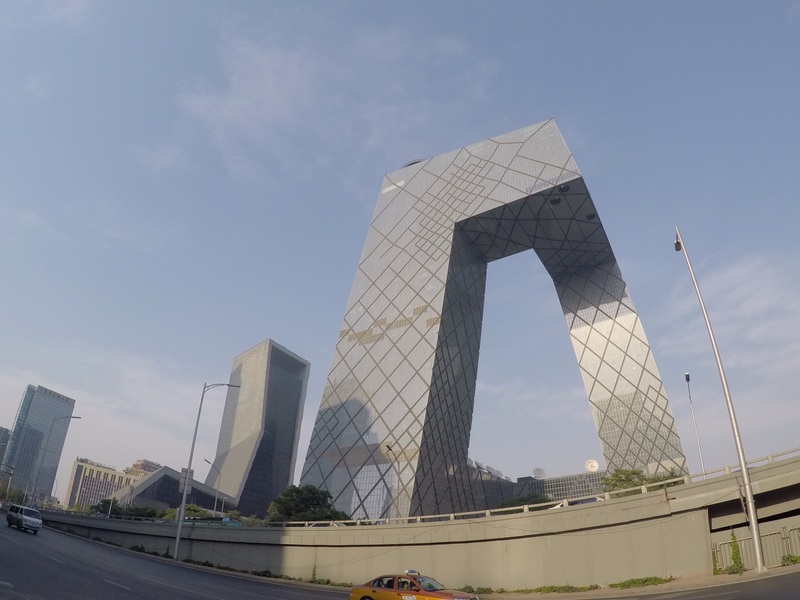 Beijing. Shanghai. Hong Kong. These are the cities that come to mind when many people think of China or envision a trip to the world’s most populated country. 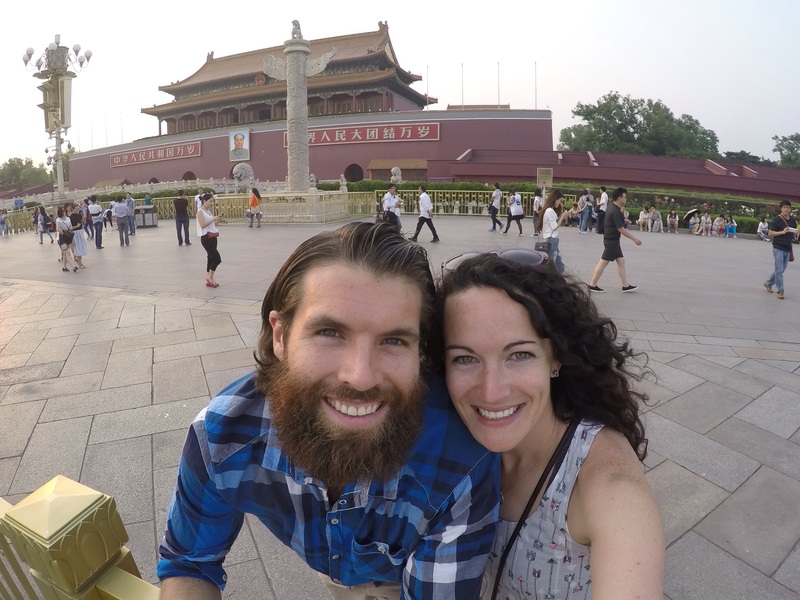 We did too, which is why we spent a week exploring Beijing. But did you know that almost half of China’s 1.4 billion people live in rural parts of the country where mountains outnumber skyscrapers and rice paddy fields stretch as far as the eye can see? We spent one month exploring rural China, what we are calling and consider to be “real China,” and encourage you to do the same if you’re planning a trip there in the future! 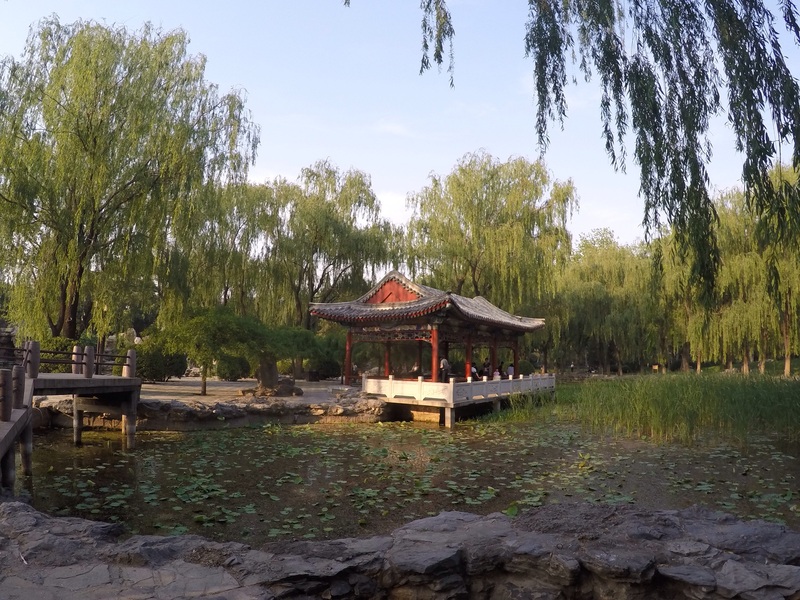 We spent most of our time in Dali, with a weekend trip to Jianchuan, but the recap below can be applied to both cities. We also got to spend time with Karen’s sister and our brother-in-law, who met up with us at this point in our journey. 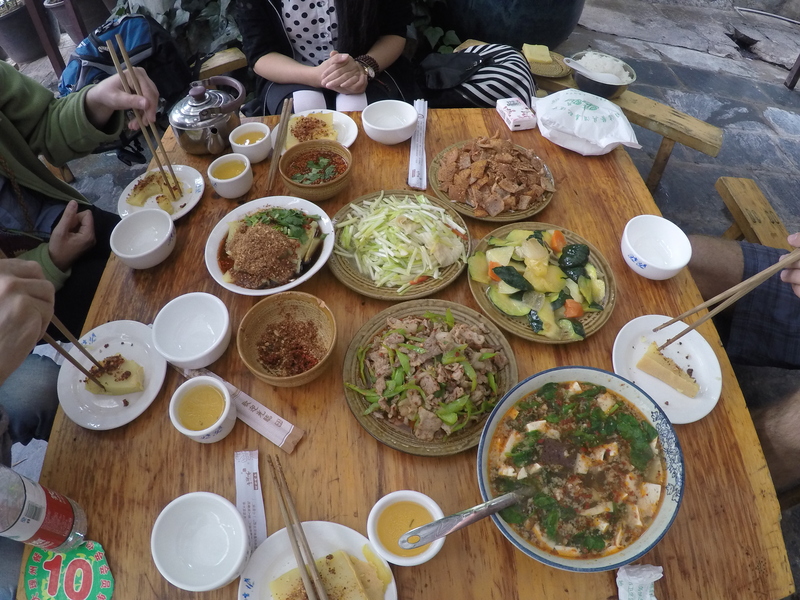 Though we both got food poisoning twice while in Yunnan (with one of those times occurring on our scheduled departure date), we did manage to try a lot of new things while learning about the traditional cuisine. Shared dishes. It is customary in China to share dishes with everyone at the table. The rule of thumb is to order one dish per person along with white rice for the table. All things pork. Seriously, they love pork and eat it in all forms. We saw everything from pork skin and uncooked pork fat cubes to blood curd soup. Spicy! We found much of the food to be pretty spicy, often topped with a type of crushed red pepper (seeds and all). Of course, if you asked a local, they would say that it was not too spicy. But our sweat glands and tear ducts told us differently! Always order soup. It is viewed as an essential dish at almost every meal. There are conflicting beliefs on when to drink the soup. Some Chinese believe that drinking the soup before the meal keeps you thin, while drinking it after makes you fat. Yunnan rice noodles. A signature noodle only found in, you guessed it, Yunnan! The noodles are typically served up in a broth with seasoning, meat, vegetables and spice. Minority groups. One of the main minority groups in Dali is the Bai people. Their influence can be seen throughout the city from the colors and designs of buildings and homes, to the local festivals and tourist attractions. In addition to the Bai people, there are influences from both the Yi and Han people, making for a diverse mix of language, cuisine, and traditions. Dali Catholic Church with heavy Bai influence. Most beautiful and unique church we’ve seen thus far! Spirits. It is common to see a small pile of food on the sidewalk in front of a home, which is believed to be consumed by spirits that visit in the night. The people also honor the dead by burning incense and paper money in hopes that the spirits of the dead will protect and bring good luck to the family. Squatties. 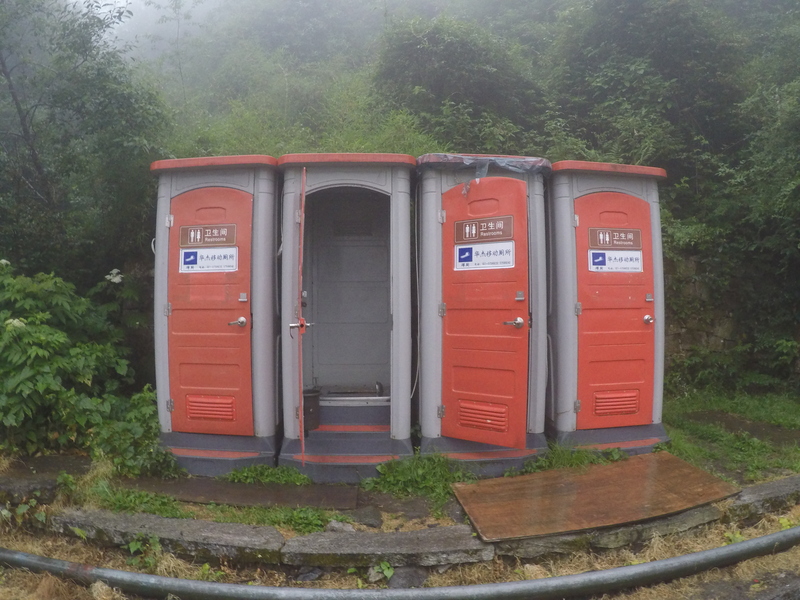 You can’t write a post about China and not mention the squatty potties. If you don’t know what these are, I recommend a quick google search. Pro tip: bring your own toilet paper and hand sanitizer. It’s rare to find either in most public restrooms. They even have porta squatties! China is different than the States in a number of ways, but the most amusing difference to us is definitely the variations in social norms. Bait & Switch. There were multiple occasions when we would order something and receive a similar, but not what we ordered, replacement. Rather than tell you when they are out of certain ingredients, servers at restaurants will take your order and then serve up something different. We experienced this multiple times (chicken parmesan instead of grilled chicken and mayonnaise and pickles in place of tartar sauce) and every time we acknowledged the mistakes they plainly replied that they didn’t have what we ordered so they brought us something different. Meaningless seat numbers. Ever seen a 6’3″ man box out a group of Chinese people in order to claim his assigned bus seat? Well, it happened and it was glorious. 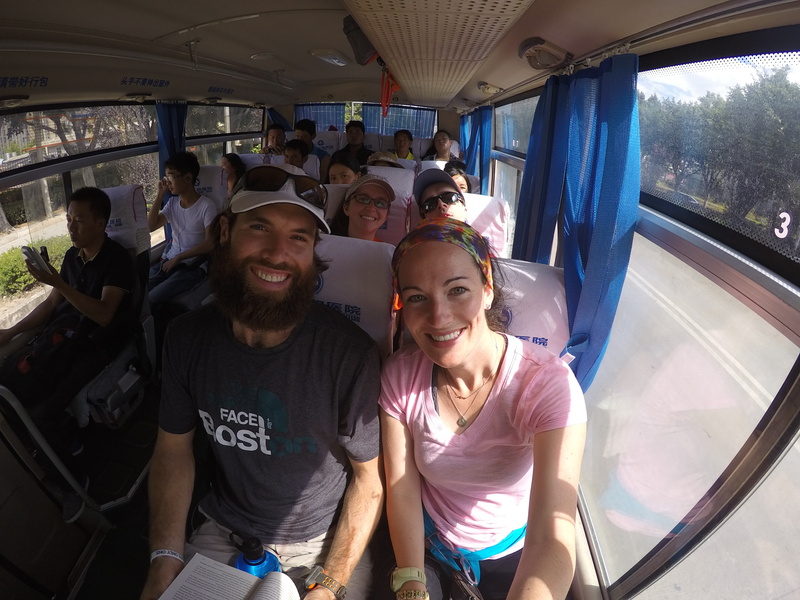 Although we were the first people to purchase bus tickets from Jianchuan to Dali, and first in line to board, it didn’t really matter because the seat number printed on the ticket is meaningless for certain bus lines. This means it is first come first serve and people can be pushy, creating a crazy chaotic scene when boarding. But, when you’re the tallest person on the bus and only a few seats have any sort of leg room, you have to do what you have to do. Public transit delays. Always leave extra time when using any sort of public transit in Yunnan. You never know when your bus will stop for a car wash, your cab will need a tire change, your bus driver will stop to pick up anyone who flags them down and will drop them off wherever they’d like for a few extra $$$, or your cab driver will surprise you by picking up someone else who called them for a ride and then ask you to wait while said person browses at a market. Seriously, these things can and most definitely do happen. 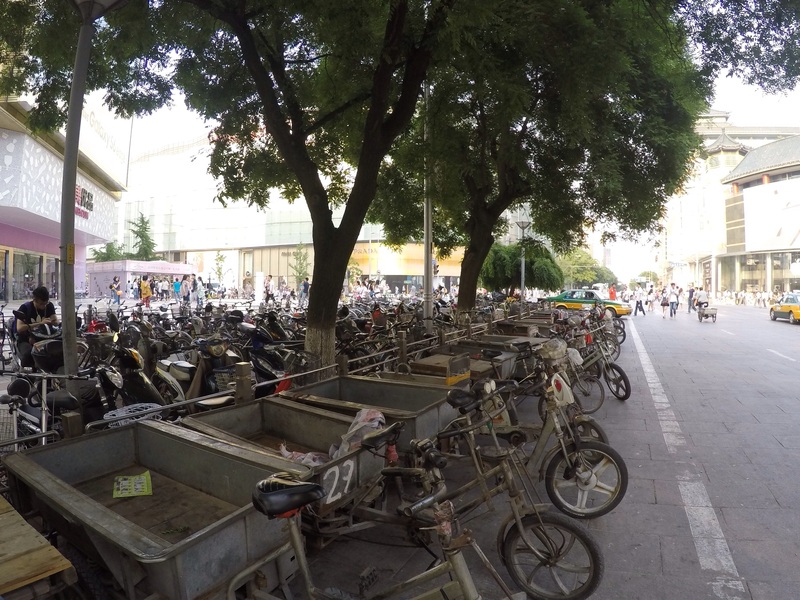 China was certainly one of those places where the lifestyle differences are palpable. You recognize just how far away from home you are, and you really get a chance to appreciate what life is like across the world! 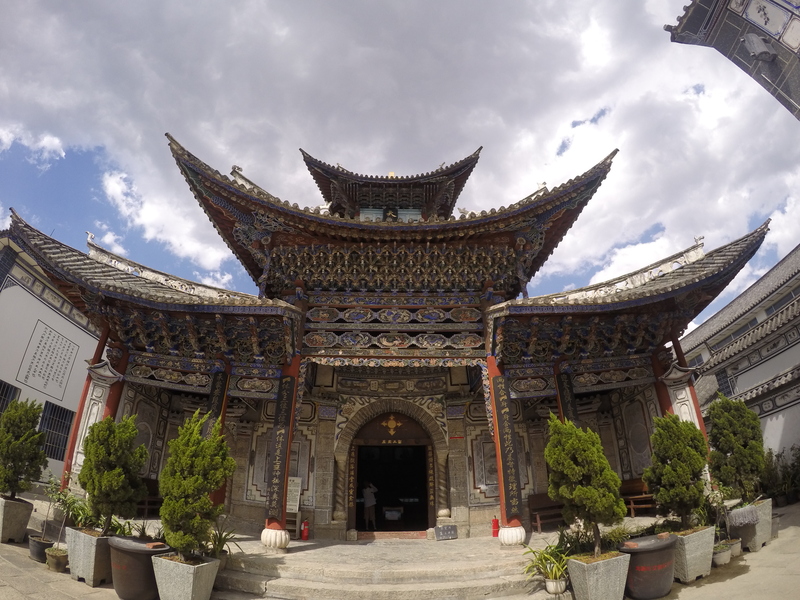 Check out our latest YouTube video below for a feel of what life is like in the Yunnan province, and be sure to follow us on instagram @kimblesinbits for daily updates! As many of you know, last week I ran in the Gobi March, a 250 km (155-mile) self-supported stage race across the Gobi Desert. The race (six stages taking place over seven days) consisted of nearly 200 competitors from 40 different countries, including several people who had placed highly in other stage-racing events. This was a completely new challenge for me, especially given the fact that I needed to carry all of my supplies on my back! Competitors are required to carry everything they need to eat and camp all week with the exception of water and a tent. My “rookie” status in this style of racing became apparent at the competitor check-in. After filling out some paperwork and checking off a list of mandatory items, everyone weighs their bag. My initial weight came in at 12kg, which comes to 26.5 lbs. To give you an idea of where I stood among the field, the lightest pack came in at just under 6kg and the heaviest pack weighed 15kg. So, I was going to be carrying much more extra weight than most! To be fair, though, much of my weight came from food and I certainly didn’t want to run low on fuel towards the end of the race. Following check-in, a three-hour bus ride to the start of the desert course, and some opening musical festivities with the local villagers, we headed to our tents to get the first of several sleepless nights. Everyone awoke to a chilly morning in a valley surrounded by the snow-capped Tian Shan mountains. It was an absolutely beautiful scene and one of the many things about this race that I will never forget. After eating the first of far too many freeze-dried meals, we got the morning course breakdown and announcements from the 4Deserts staff. The competitors lined up, waited for the countdown and 3…2…1…the race began! To give a full race recap, I would literally need to write a novel. Instead I will list the three most memorable moments (good and bad) from each of the six stages. 1. 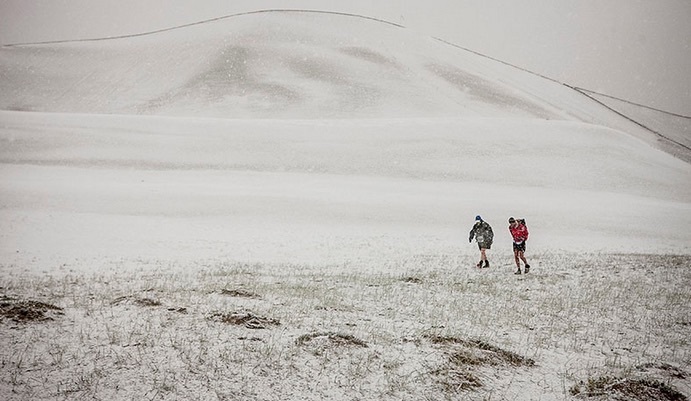 Running on the crest of a sand dune (nearly a mile-high) through a vicious snowstorm. It was pounding snow so hard I could barely see, as my feet were trying ever-so-hard to trudge through soft sand. Possibly the most unforgettable running moment of my life. 2. Watching the weather change throughout the day. After the snow subsided in the afternoon, the sun came out and melted nearly all of it, including every bit that was on the sand dune! 3. Finishing the stage in first place! Fighting through the tough conditions to come away with a stage one victory was truly special. 1. Running up a snow-covered mountain. About a mile into this stage, we had to summit a mountain to reach the highest point of the race at 8,400 feet of elevation. My feet weren’t dry for more than a couple of minutes during this stage, because I spent most of my time stepping into snow past my knees! 2. Chasing down my buddy Kyle. Kyle McCoy, who ultimately took third place overall in the race, was one of my best friends in the competition. In this particular stage, Kyle set a hard pace after we summitted the mountain and I chased him down the rest of the day to finish just minutes behind for second place. 1. Running on a road! For a race taking place in the desert, the terrain varied widely and was often quite technical and difficult to run in. However, during this stage, we got a 5k section on a paved road! 2. The freezing rain. Toward the end of this stage, the temperatures dropped to near freezing with rain pouring down. 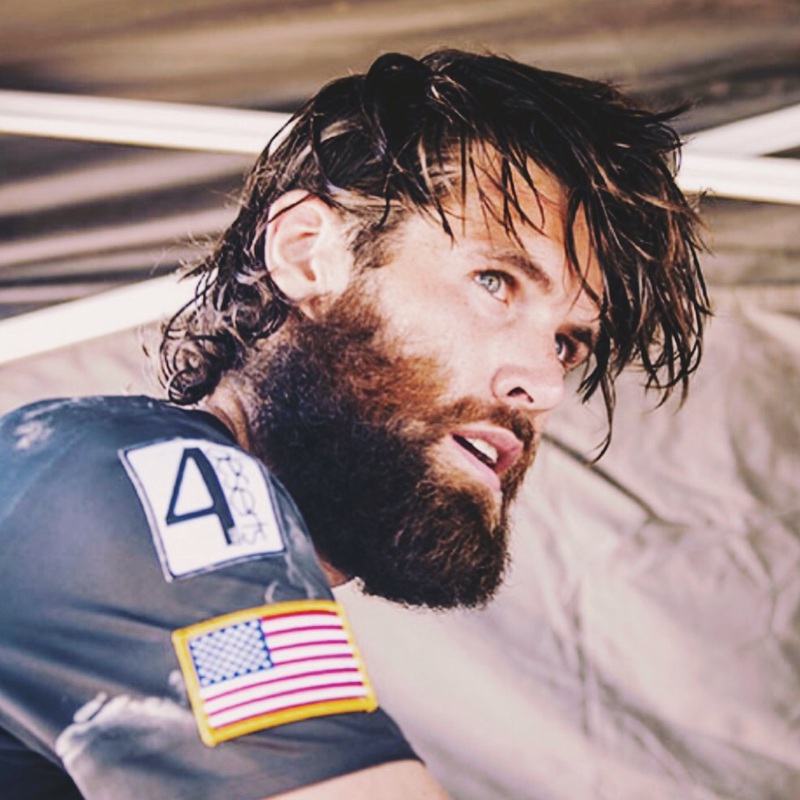 After finishing the stage, I shivered inside my sleeping bag for over an hour before my body temperature leveled out! 3. Finishing the stage with Kyle. The stage was dominated by Ralph Crowley, the other American in the top three. Kyle and I were about ten minutes behind him, as we ran nearly half of this stage side-by-side. We even crossed the finish line together, a memory I will always cherish! 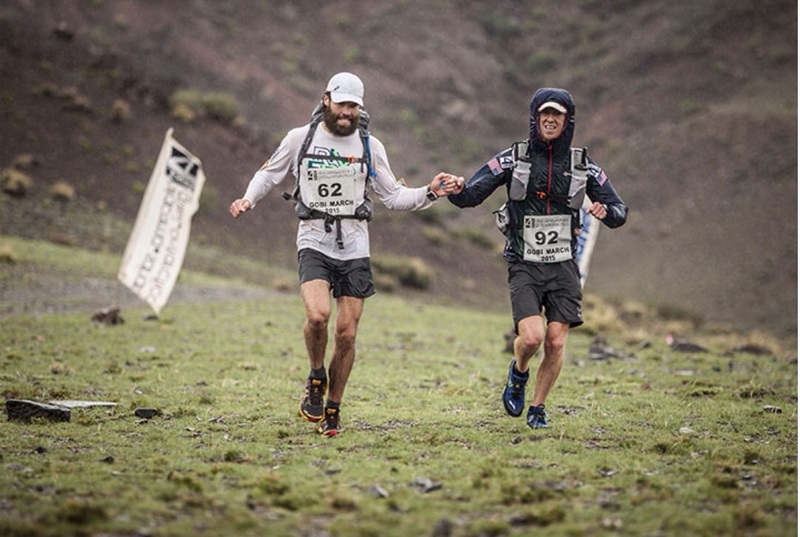 Kyle and I fist-bumping at the finish line! 1. Going out FAST. This stage was 26.7-miles in length, and after three straight days of marathon-length stages, we ran this one in under 3 hours and 30 minutes. Kyle set a ridiculous pace and Ralph and I just tried to keep up. I finished seven minutes behind Kyle and Ralph was two minutes behind me. 3. Backpack mishaps. Since I was using a Camelbak bladder for water while many other competitors used water bottles, I was forced to take off my pack to re-fill water at checkpoints. At the final checkpoint of this stage, I closed the water bladder incorrectly, one of my bib safety pins popped off and the nozzle of the Camelbak flew off. All of this with Ralph just minutes behind me and closing fast! 1. INSANE HEAT. This stage was 50.3 miles in length, and the temperatures reached a staggering 120 degrees Fahrenheit. And how about wind? Well, there was very little of it, and most of it felt like a hair dryer was being blown in your face. This was easily the most challenging race I’ve ever experienced, but God lifted me up and guided me through in a big way! 2. Running out of water. In between checkpoints 5 and 6 (7 was the final checkpoint), I ran out of water more than two miles away from the checkpoint. My mouth dried up so fast that I had no choice but to walk. I even drenched myself in water at checkpoint 5, and within ten minutes I was completely dry. This heat was no joke! 3. Crossing the finish line. All day I had been told that Ralph was 40 minutes ahead of me. Somehow, someway, in the final 12 miles of the course, I made up 25 minutes on him! I was certain that he had bounced into first place, but after I crossed the finish line he said he came in only 15 minutes earlier. That meant one thing: I was in first place! Soaking my head at one of the checkpoints during the Long March. 1. The sandstorms. There were some serious sandstorms that swept into our campsite before the sixth and final stage. We actually had to sleep outside because the wind had blown down all of the tents. I’ve never eaten more sand in my life! 2. The waiting game. I was expecting a nice and relaxing Friday after the Long March to recuperate before the final 7-mile stage on Saturday. However, the sand, wind and intense heat made it impossible to relax and stay comfortable. Plus, all I could think about the whole day was the final stage! 3. The announcement. At 2am on Saturday morning, the wind got worse and it began to rain. At this point we were told that the final stage would have to be cancelled. I was looking forward to duking it out with Ralph on the final state (I had a 5-minute lead), but it never came to be. However, the cancellation meant that I was the official champion of the Gobi March! It also meant that the top three overall finishers were from the USA, an even more impressive feat that had never been done by any country before (in a single stage, much less overall). I can’t even begin to express proper gratitude for the prayers, emails, blog comments and well wishes that I received during the race. After I had access to internet following the race, it was like Christmas morning reading what everybody had written. The emotion and the strength that I felt from everyone when I read their messages at the Cybertent during the race will always stick with me. You’re all a tremendous blessing to me and I am forever thankful for your love. You led me to become the 2015 Gobi March Champion! If you’re interested in reading some of the news, recaps and results information from the race, feel free to visit the 4Deserts Gobi March webpage.